In this article, we will be taking a look at the best treadmills under $1000. 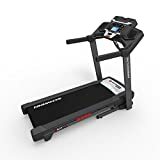 At this price range, you certainly get a lot for your money, including a large running surface, a more sturdy and robust product, multiple settings to track your workout and even make it harder. Treadmills are a great addition to your home gym given that they can be used no matter what the weather is doing outside. There are other benefits too, like being able to keep an eye on the kids whilst you workout and they are generally better for your joints too as the large running surfaces are padded – unlike the road! The LifeSpan TR2100i has one of the highest reviews of the pack from current users, many of which have stated that it is both easy to assemble and comfortable to run on over extended periods of time due to it's highly cushioned running pad. With a slightly shorter running area than others in this group and a 2.5 HP motor, it is certainly a high performing machine and comes with a lifetime warranty on both the frame and the motor itself. With ProForm being one of the top treadmill brands, you will see a number of them featured here in this guide and for good reason. The 995i is the top of the range model that has everything the others do and then some more thrown in for good measure. 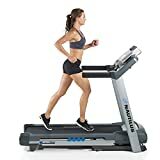 With 30 workout programs and a 60″ long-running platform, combined with the 3.0 horsepower motor, this is a great treadmill that surprisingly comes in under our $1000 budget. The Proform 505 CST offers a great balance of technology, price and performance and is a great blend of all the features you will find on the top 10 treadmills under $1000. There are 15 program workout settings and you can also control your workouts with Google Maps to provide that truly outdoor running experience. Schwinn is another well know brand in the fitness and exercise arena, the also have ellipticals, power-racks and some great treadmills, like this Schwinn 870 featured here. 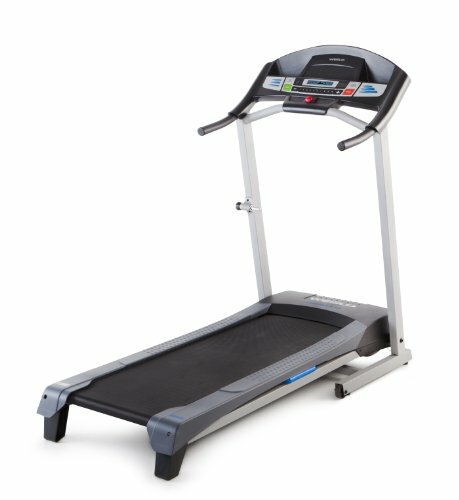 Users of this treadmill have commented on the larger than average running deck along with the quality and sturdy frame and build quality. The 870 also boasts 26 different workout programs which make this the pick of the bunch if you're looking for a varied workout. Next up we have another entry from ProForm, this time, the Power 795 model, which despite its narrower running deck, does have a 3.o hp motor and 24 workout settings. Users of this particular model have stated how easy it is to assemble given the very detailed instructions that come provided and the unique space saving design really does just that. 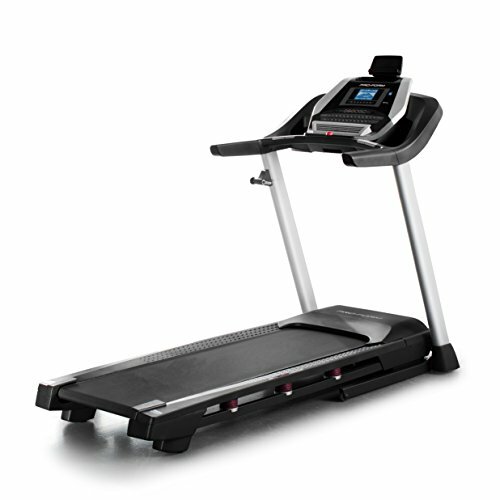 The Weslow Cadence R 5.2 comes in at our cheapest sub $1,000 treadmill to be featured here. In fact, at the time of writing it is on sale for almost half of our budget, however, I felt like I should feature this model for a few reasons. First, the Weslow brand is focused on just a core range of products, which means that attention to detail is made on everything they produce. Secondly, they offer great value for money and a great space saving design. For example the Cadence R 5.2 measures just 28′ deep when folded away. The Horizon Fitness T101 has been voted best “Value Buy” by the Good Housekeeping Institute and for good reason. 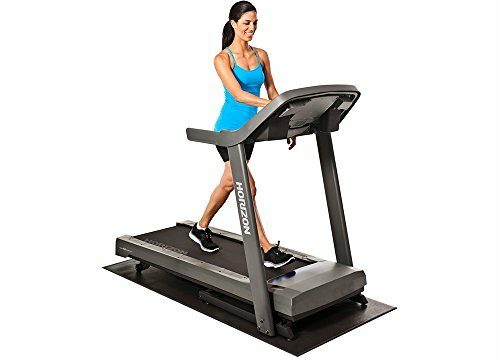 This treadmill folds away to a compact size of just 45.5 x 33.5 x 61″, offers 30 workout programs and a lifetime warranty on the frame and motor. It also sits right in the middle of the pack on price, a nice combination of features, functions and value for money, perfect for your home gym. This is the second Schwinn model in our top 10 treadmills list and for good reason, the 830 is an earlier model to the 870 featured earlier and offers good value for money and has some great ratings from existing users. Customers who have purchased this model have commented on how comfortable it is underfoot when running due to the cushioned deck and they also like the media shelf which allows for a book or a tablet to rest whilst you workout. 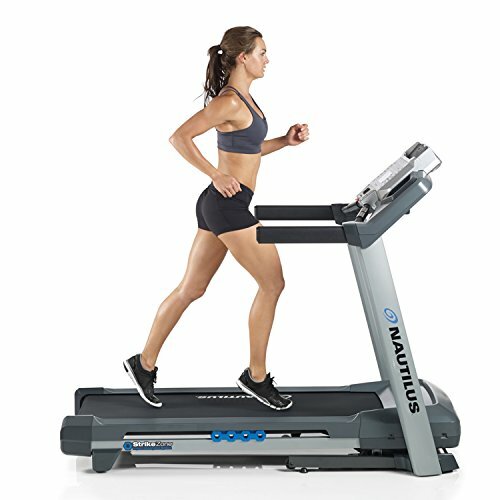 The Nautilus T614 does sound more like a spaceship than a treadmill, and when you see the features on it I'm still not sure which it is! 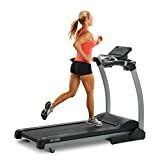 Sporting 22 different workout settings and a large backlit LCD display to track your progress, you also get a 20 x 55″ running deck and a 2.75 hp motor. Our final entry is another by the ProForm brand, this time, it's the ProForm 600c model, which aims to have a little bit of all of the above products rolled into one machine. From the backlit LCD display to the extra long 60″ running deck and the 22 setting programmable computer you really do get a lot for the price you pay. 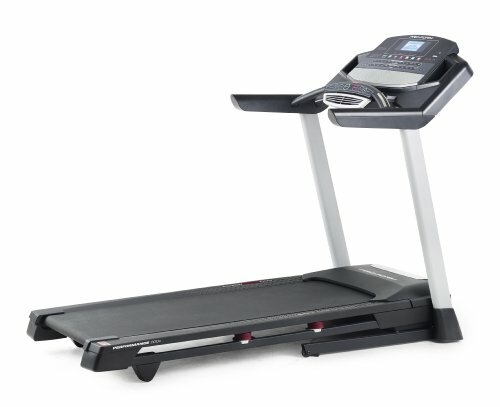 First up we want to pay attention to the deck size., this is the treadmill platform where you will do your running. Now no matter what you may think, none of us run in a straight line, we move from side to side as our feet land in different positions and our body weight shifts. So you need to make sure that the deck is wide enough to accommodate your running style and body size. If you have wide hips or a wide stance then you should look for a wider platform. Generally, the deck sizes range from 16-20″ wide and around 50-60″ long. S that should give you a good idea of what to look for in terms of the deck size. 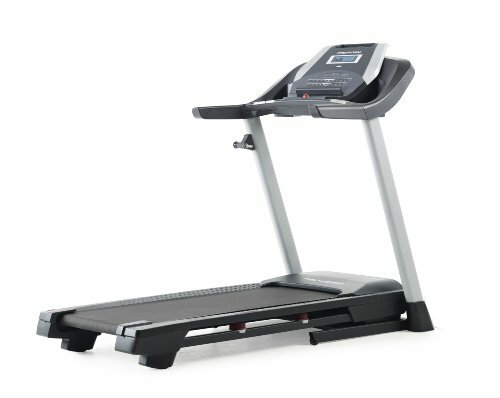 The great thing about treadmills in the $500-$100 range is that you do generally get a larger running space as standard. The horsepower comes from the motor and it's the motor that drives the running deck. To put it simply, the higher the HP the faster the machine will go, which seems to max out at around 12 mph for the majority of the sub $1000 treadmills. For this price range, you should be looking to choose a machine that has a 2.5 to 3.0 HP motor as a minimum, anything less should be reserved for the $500 or under models which don't offer as much power, features or stability. With any home gym, space is always going to be a concern. 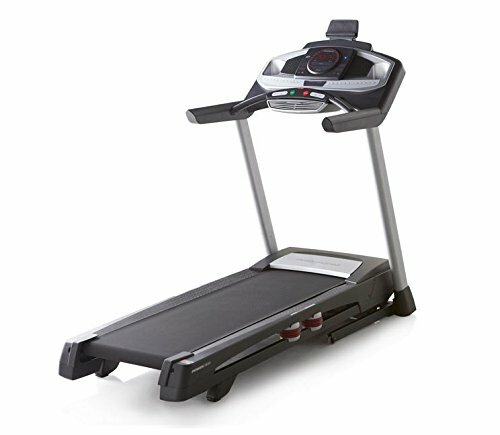 If you need a treadmill that is compact or one that can fold away and slide under the bed for example then you can use our table below to find one that meets that criterion. Of the top 10 treadmills reviewed in this guide, 9 of them are folding treadmills, so they will allow you to fold down and store out of the way. One important thing to point out here is that not all ‘folding' treadmills are created equal, so be sure to check out the individual size specs we have included for each of the top 10 models. When taking delivery of your treadmill you should ensure that there at least two people at home to help with the lifting, pushing and pulling. Some delivery services will help you to place the equipment in your dedicated gym room, however, some others will unload the van and leave you with it. Bear in mind, these things are heavy, heavier than an elliptical trainer, in fact, so it's without a doubt a job for two or more people. Heck, you will get a workout just from moving it into place! You should ensure that you have enough space to fit the treadmill in your desired location. So be sure to check the width and the length of each treadmill before making your decision. The height only matters when it comes to folding treadmills, in which case you also need to make sure that if it is to be stored in a cupboard, that it will fit.